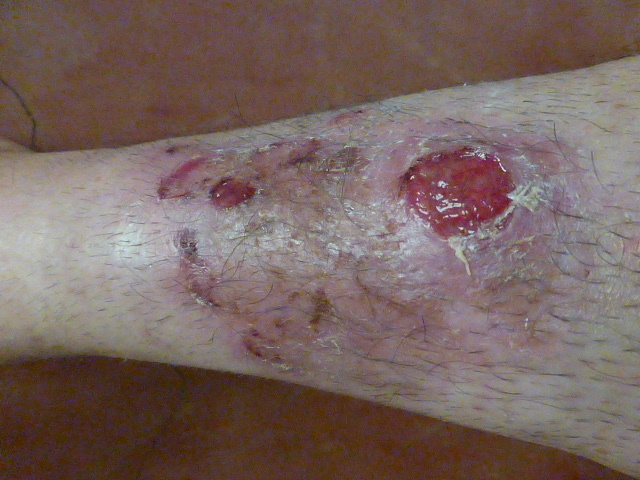 While we were in Canada, the infection got significantly better (even though it spread to me for a few weeks). One of our friends who had worked overseas said “Yeah, I had something like that on my face. It took 8 months to heal.” We were hoping it would be less. 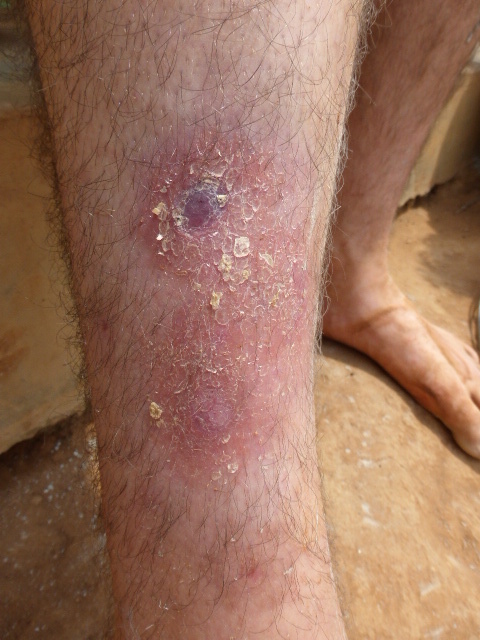 It was contained to only one leg and looked prettty good by the time we returned to Rwanda. We wanted to avoid antibiotics if at all possible, mainly because Mike has had a lot of rounds of antibiotics. We found, strangely enough, that applying a layer of onion to the infection not only lessened the pain, but also helped the infection heal. So he slogged away at it, carefully cleaning and dressing the wounds each day, (smelling like onion all the time) and after a temporary setback probably caused by a lot of hours on a plane, they started healing again. By November, we thought the wounds were going to be healed by Christmas. They were almost closed up (which may have led to a bit of lax-ness on the daily cleaning and dressing). Then suddenly, they started getting bigger and more painful again. (We had learned that it was fairly easy to tell whether they were spreading or healing by how red and angry the surrounding skin looked.) After a couple weeks of the infection getting worse again with no sign of any change, in discussion with google and one of our co-workers (who is a nurse), we bit the bullet and put him on antibiotics at last. The scars are going to be prominent for awhile, the to layer of skin is still peeling a little, but finally, after over 9 months, the infection is gone!